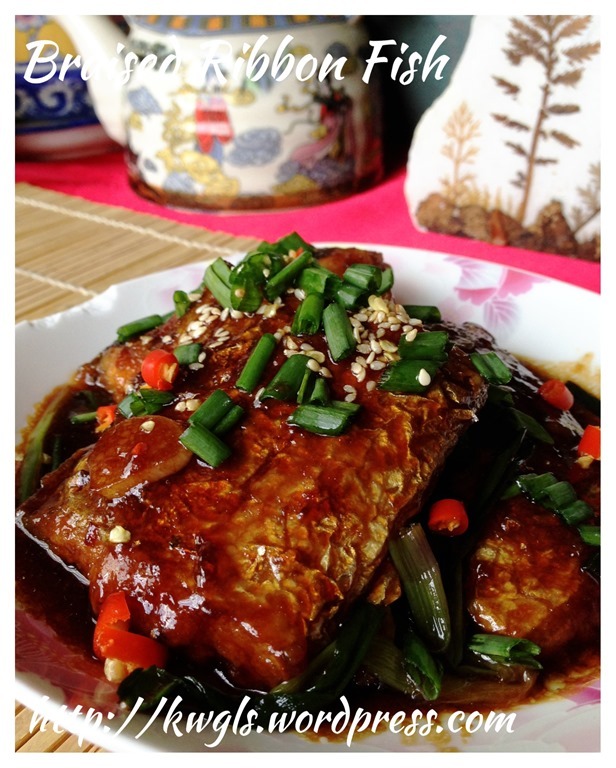 I have the intention to start a new series that will share simple and common household dishes. My aim is to provide inspirations to new house chefs who have not have a chance to learn simple household cooking. These recipes are simple, down to earth and suitable for daily cooking. Experience house chefs, bear with me the simple recipes and I hope we can also share how these dishes can be further improved.. 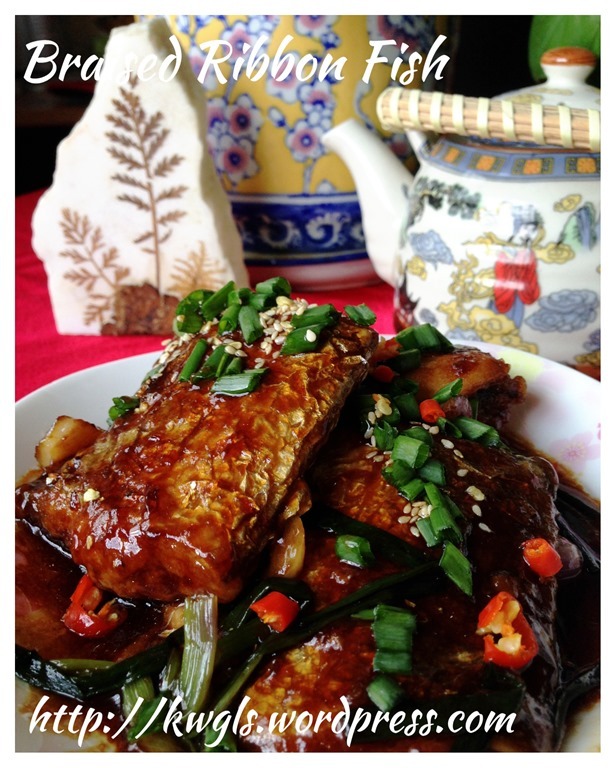 This is a dish that I have been eating when I stationed in Shanghai. My helper and my ex-company’s cook in Shanghai cooked this dish at least once a week..Therefore I am rather familiar with this dish and I do missed this dish when I stationed in Singapore. 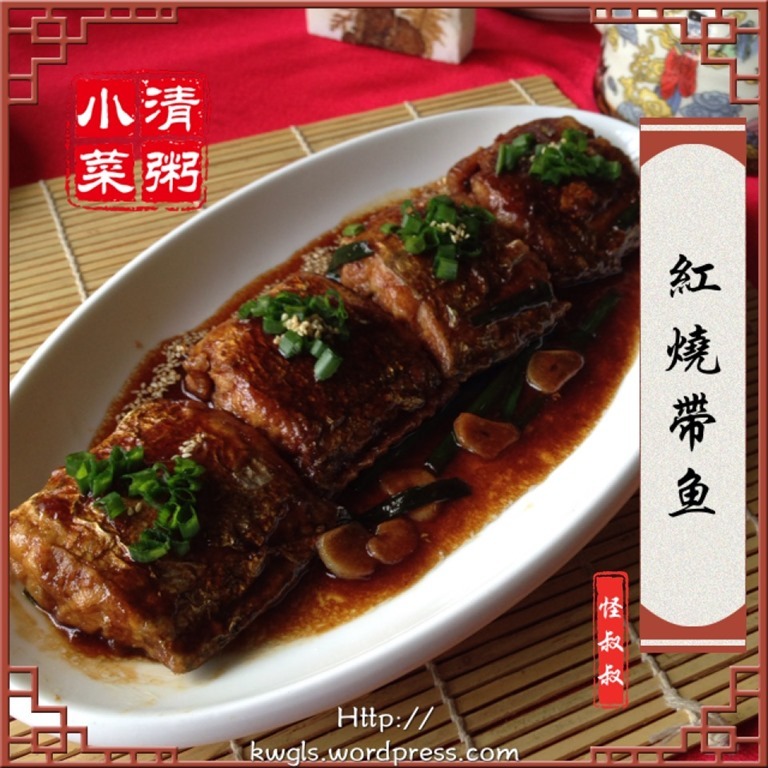 In fact it is also a very common dish in mid level Chinese restaurants..
My wife love ribbon fish. I love ribbon fish too.. 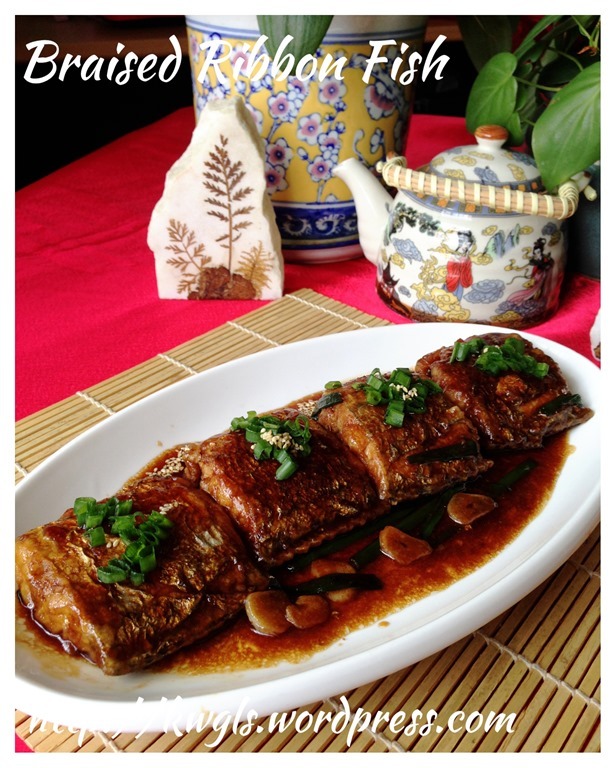 But we usually pan fried the ribbon fish and dip in special sauces such as chilli, lime and dark soya sauce. 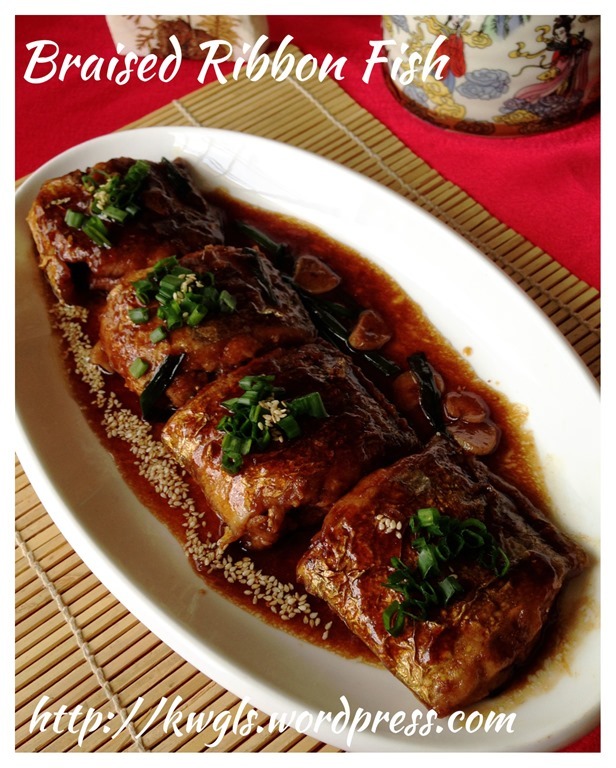 At time, minced garlic were added too… This is one of our favourite fishes because it is economically priced, not fishy, meaty and with very little small bones. It is sweet and the meat is tender. In general, ribbon fish is defined as “any of a number of long slender fishes that typically have a dorsal fin running the length of the body, in particular.” . I am also rather confused as some said it is called a hair tail fish or belt fish. I am unsure whether or not all these three are the same, but what I am referring is the fish as in the picture below. 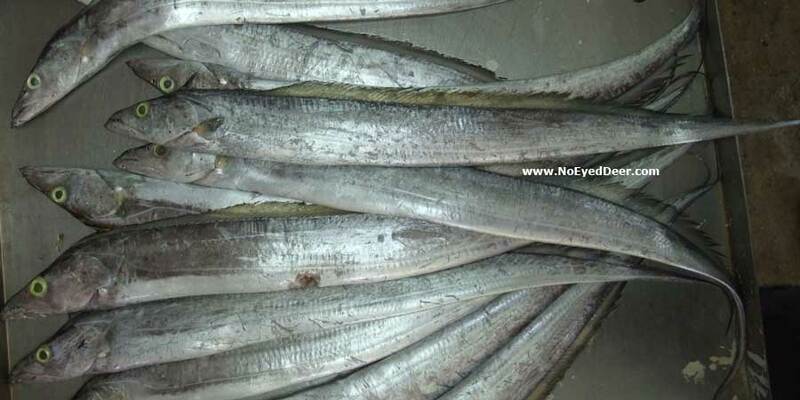 (Picture courtesy from: http://noeyeddeer.com/fish/species/trichiurus-lepturus.html). When you buy the fish, it is advisable to purchase the whole fish, ask the store owner to cut into your desired sizes and I usually throw away the fins, head and tail. 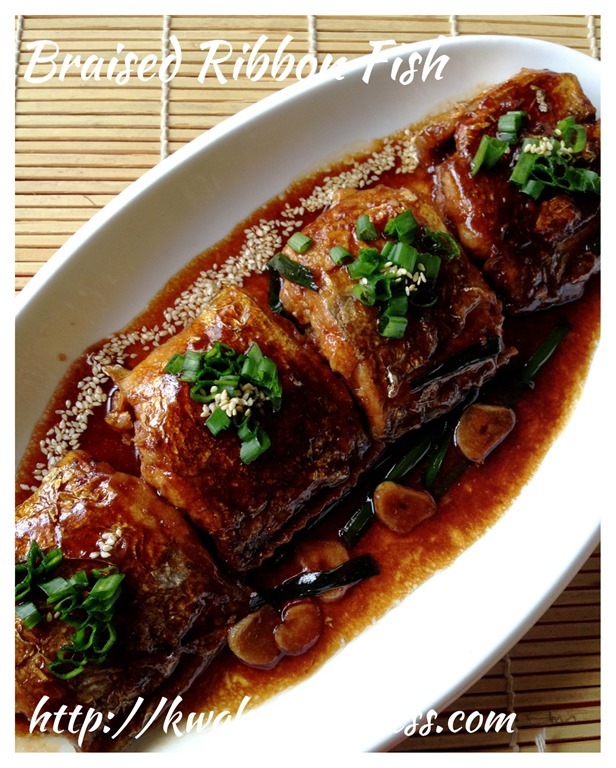 I am happy that my kids loved this braised ribbon fish dish. They especially like to gravy to go with the rice.. In this illustration, starch is added but that is totally optional and I will let the readers to decide on this.. For those who like it a bit spicy hot, you can also add chilli to flavour the dish. Whether the dish should be slightly sweet or savoury is also up to reader. In this illustration, it is more on a sweet side. 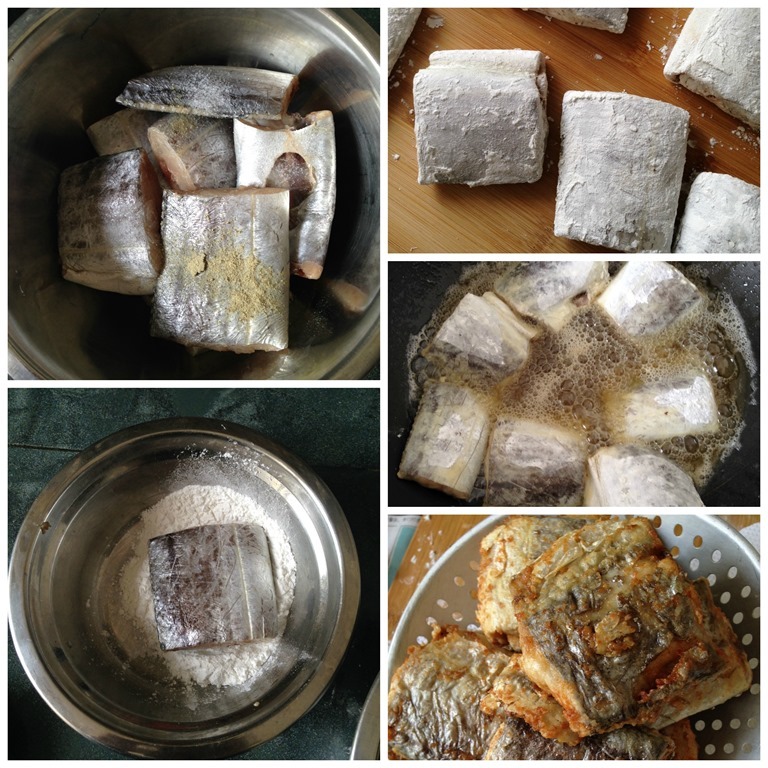 If you like savoury, just omit the sugar..
Wash the fish, drain and pat dry with kitchen towel. Add in pinches of salt and white pepper. Let it marinate in the fridge for at least 1/2 hour without any cover. 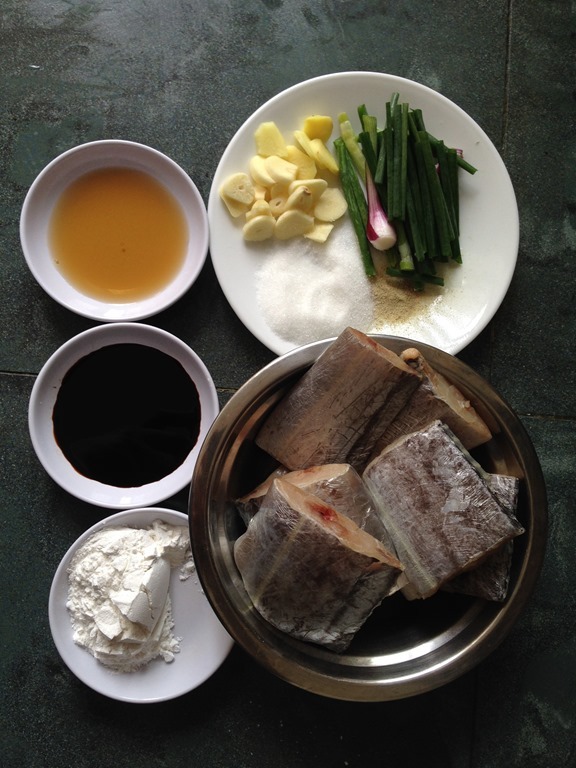 Coat the fish with the rice flour as evenly as possible. In a frying pan, heat up some cooking oil under high heat. (You have the option of either pan fry your fish or deep fry your fish). 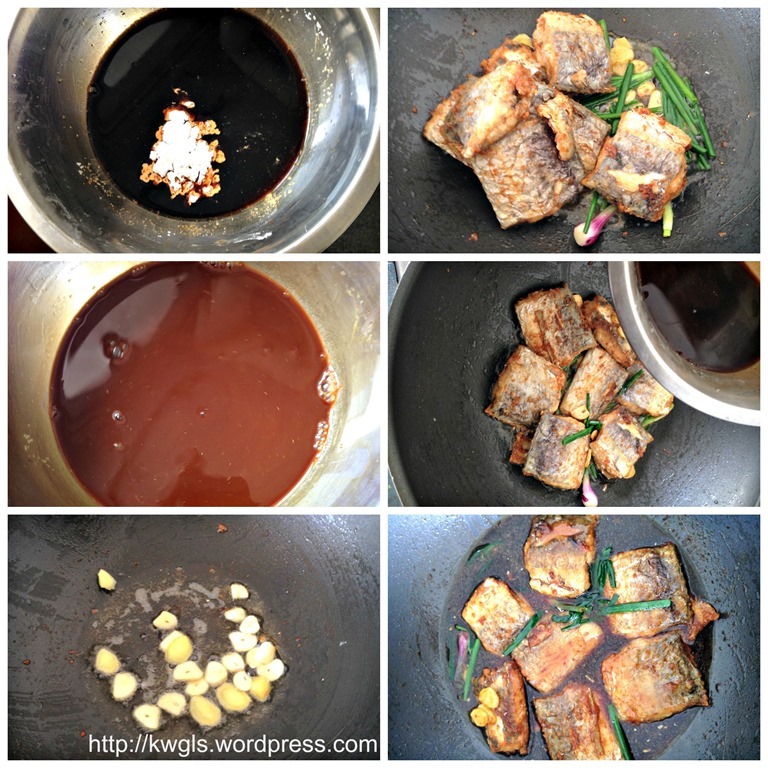 Add the fish , and reduce the heat to medium, deep fry or pan fry the fish until the exterior is golden brown. Drain and Set aside. 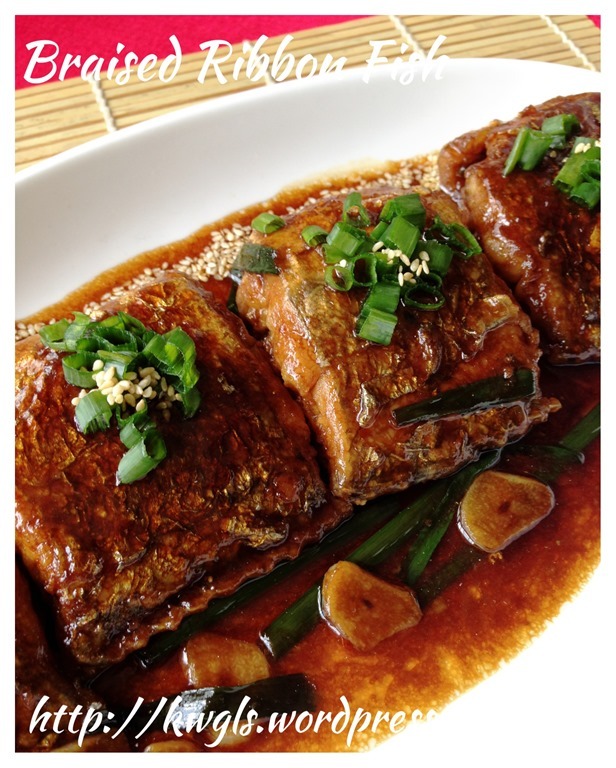 In a frying pan, have 1 tablespoon of oil, sauté the ginger and garlic until fragrant and lightly brown. Add the fish, chilli (if any) and spring onion, stir fry for one minute until the flavour are well incorporated. Add the starchy solution above, let it simmer until your desired texture or until the gravy thickens. If the gravy thickens too fast, just add in more water and simmer until your desired texture of the fish and consistency of your gravy. 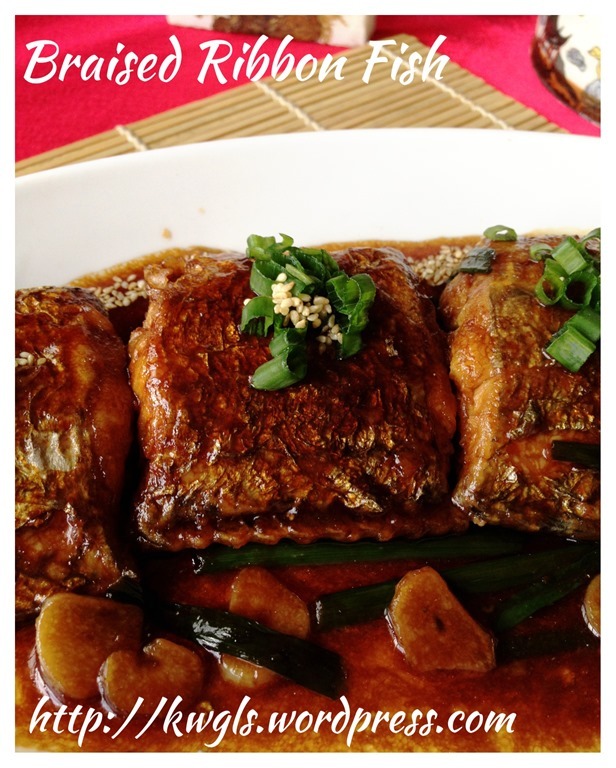 This is a simple household recipe for braising fishes. Do not be constrained by ribbon fish alone, in fact most fishes can be used. Some of the suggested species are milk fish, sole fish and many more.. 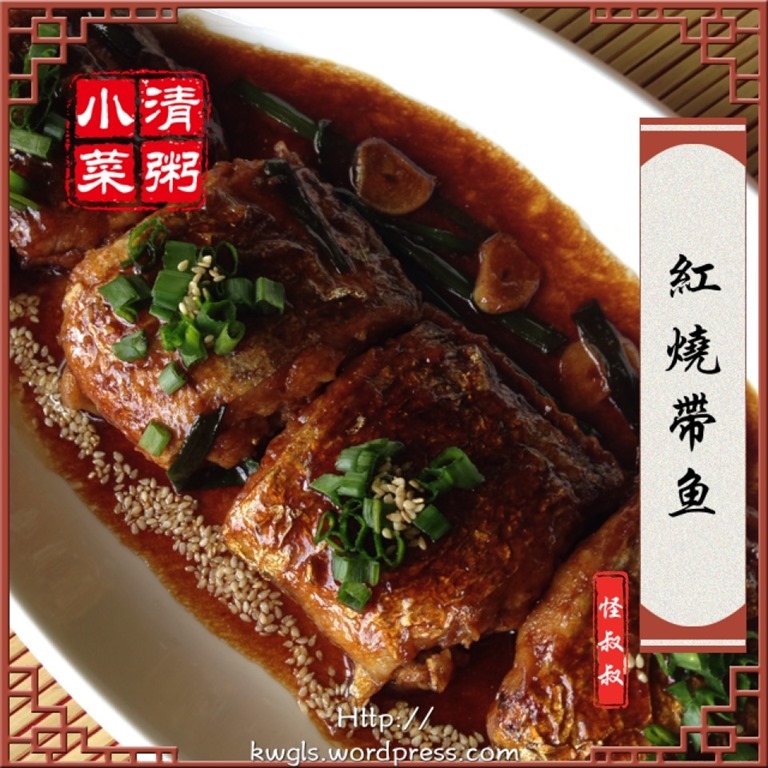 This entry was posted in Dish, Food Preparation Series, Seafood Dishes and tagged beltfish, Braised Ribbon Fish, 红烧带鱼， 8， postaday, GUAI SHU SHU, Guaishushu, hairtail fish, kenneth goh, ribbonfish. Bookmark the permalink. So happy to hear that it is of help to you.